On March 27, we’re hosting another salon for women. It’s been a year (!) since the last one, and we’re excited to get things going again. This month’s event is focused on women and money — what we can do with it, how to invest in ourselves and the people / projects we believe in. The event will include a featured conversation with Melissa Moore and Amee Mungo, along with a special guest - to be announced soon. And as is our style, we’ll open it up for everyone to share thoughts, ask questions, add her voice to the discussion. More details posted shortly. In the meantime, please reach out if you want to learn more. It’s official: we are co-founders of Revoice Media, a digital media company that focuses on music and entertainment podcasts. We began with Andy Grammer’s podcast in mid-2018, and recently launched “Wheels Off”, a podcast created and hosted by musician Rhett Miller. Rhett interviews Rosanne Cash, Fred Armisen, Rob Thomas, Will Forte, and other notable personalities. Episode 5, an interview with graphic designer Aaron Draplin, was published yesterday. Meanwhile, over at Studio Kairos, we’ll increase focus on the live experience. Our next event is Tuesday, Feb 26 in partnership with GoKartLabs. 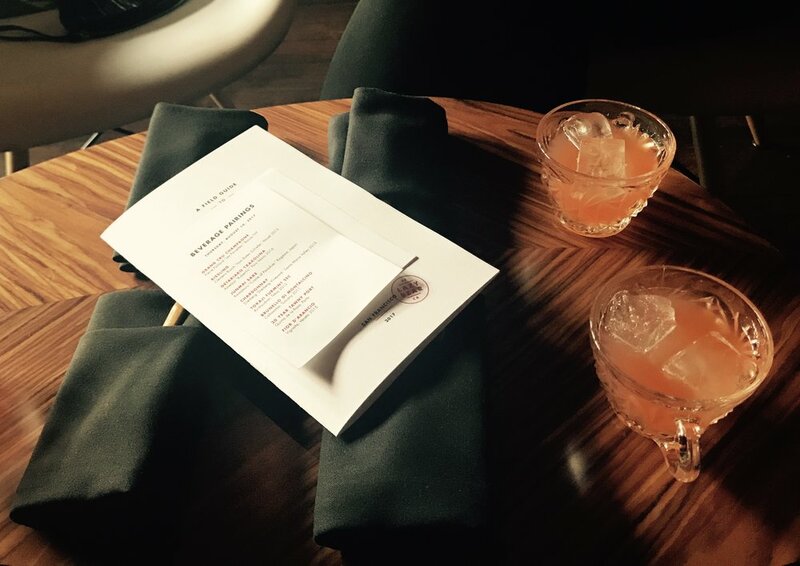 We will be discussing digital transformation over food & drinks at Norwood Club. In March, we’ve got a women’s salon event on Tuesday, March 19 that will feature women in finance and funding (founders, take note). And, Revoice will produce some live podcast shows later this year. Feel free to email if you’re interested in attending or want to learn more. I like this image because it’s clear and focused, however you can’t see what’s around the bend. It could be more of the same or total chaos. And that feels very similar to how business has gone this year. As 2018 winds down, there’s finally time to reflect. To begin, I haven’t posted an update or sent a newsletter since July. I recognize that this is not good for business and I don’t really have an excuse other than the unoriginal “business has been overwhelming, leaving little time for anything else”. (takeaway - delegate, or hire someone to manage your news/media/business updates for you. #2019goals). Over the last 15 months, the partnership with Revoice has pushed Studio Kairos in the direction of producing content as a primary service. We are letting go of managing speakers (though we keep our select group on the site because we continue to promote their talent and remain partners). And we still produce live events and conferences, though are moving in the direction of producing events that relate directly with the audio & video content we produce. It’s an exciting time. The first music-related podcast we produced was with multi-platinum recording artist Andy Grammer called The Good Parts. The show launched in June 2018 and was originally meant to be a limited series to promote his summer tour. It’s so good and so popular that we kept going. We’ve just published episode 11, which was recorded live in L.A. We’ve now got several new shows in development, one that will will launch in December and the others in early 2019. Studio Kairos, in partnership with Revoice, can now offer in-house content development, production, distribution, and marketing services to clients that are interested in exploring a new way to tell a story or engage an audience. Watch this space to see where we go from here. In the end, we decided to keep things simple. We'd begin by working directly with musicians who already had ideas - or recorded content - ready to go. Our project has turned into Revoice Media and our first client is award-winning pop singer Andy Grammer. His podcast, called "The Good Parts", will be live in a week. And it's really good. It took more than a year, but we're finally getting this thing off the ground. This week, the Techonomy team and I went to Detroit to meet with Ford to learn about their vision for the future. Part of that future includes bringing the company back downtown. They've purchased the Michigan Central Station, the iconic building that has been vacant since 1988. Ford will take on the massive task of renovating the building to create a new workspace in Corktown. We also hosted a community event at Gold Cash Gold, a fantastic local restaurant in a former pawn shop. Chef Brendon Edwards is a super cool, low-key guy who made his famous fried chicken for us (even though it wasn't on the menu) and spent time chatting with everyone who attended. Here's Techonomy founder David Kirkpatrick's report from the trip. 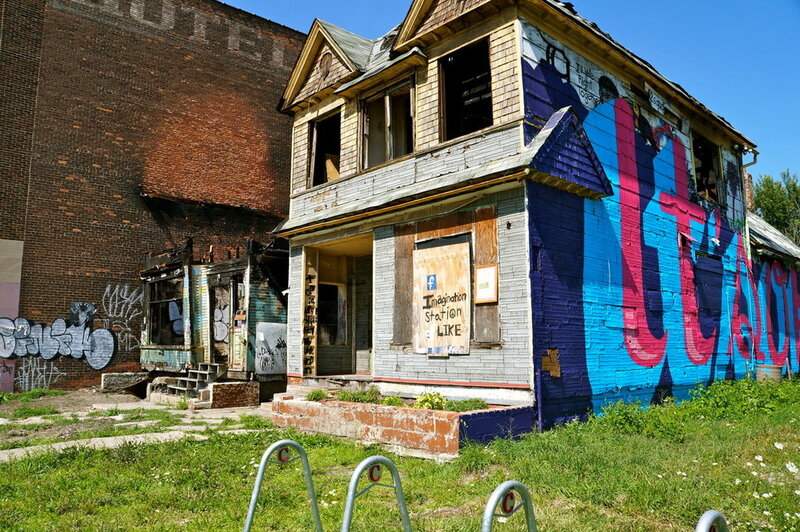 I've been to Detroit regularly over the last few years (as I've written about before) and each time, it's striking to see the change happening in the city. See below -- two photos of the same house, taken 5 years apart. Long before #metoo and the recent awareness about women's issues, I was having conversations about how to create something for women - an event, a media platform, a company. A platform for diverse female voices to talk about real issues, solve problems, and just have a comfortable place to hang out with like-minded women. As an event producer and programmer, I find the lack of female representation at conferences appalling, and have worked to correct it where possible. It is more difficult than it should be to get a company to put forward a female speaker. 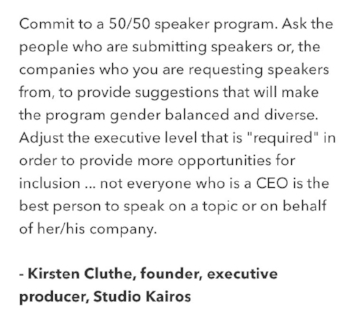 I've heard many ridiculous excuses and have often been ignored when requesting a female speaker, even when pressing to hit a 50/50 gender balanced stage. The recent call out of lack of female presenters at CES by the Advertising industry is a step in the right direction, for sure; but we still have a long way to go. In response, I'm starting an event series for women. It's not the most original idea, of course, but I have been thinking about doing it for a long time. There's no reason to wait. I have two amazing partners in this effort - Manoush Zomorodi, who is a co-founder and host; and, Amee Mungo, a digital strategist and entrepreneur who has been scheming with me for years. Our first event is on January 25 in NYC. Our mission is to build a strong, vibrant community of women who don't need anyone's permission or promotion to speak. We will cover issues that we grapple with every day, and provide an open, supportive network from which to pull inspiration, ideas, and energy. Away from the internet, IRL. Our first event features Manoush in conversation with Azita Ardakani about how our unconscious world shapes our career more than we know; and that by having a relationship with our inner world, we can empower what we create in our outer world. If you're interested in learning more, please get in touch. Commit to 50/50, at minimum. A few days ago, a number of high-powered executives called out CES for the lack of female speakers on the upcoming 2018 program. The Drum brought the story to life and asked for comments. So we contributed, glad to see this become part of a larger conversation. This is an issue we've grappled with for years, not only for major industry conferences and events, but on projects where diversity of thought is a key component of changing direction, shifting culture, and driving innovation. And even though they recognize the need to change things up, there are far too many leaders who prefer to stay comfortable with things as they've always been. Gender balance, diversity of perspective, and inclusion should be imperatives for anyone who produces and programs an event. Any organization that doesn’t recognize the importance of this moment is simply not progressing at a modern pace. There's an internal debate going on at Studio Kairos about which medium is most valuable when sharing news and content - a blog, a newsletter, or social? Social trumps all, I think, so really the question is what complements that effort? To find out, we've been off the blog for a few weeks to work on our version of a newsletter. It's called The Edit and we launched it this week. Here are a few stories that were in the newsletter - and, a few that weren't. If you're interested in receiving The Edit in your Inbox once a month, let us know! Dan Costa interviews NerdWallet founder & CEO Tim Chen about the future of finance. Dan Costa, Editor-In-Chief of PCMag.com, was recently in San Francisco to interview several tech company founders about productivity, including Tim Chen (above), the CEO of NerdWallet. Tim thinks of NerdWallet as a "book of maps" for personal finance, orienting people so they can make the best financial decisions for every stage of life. He and Dan covered a lot of ground in their conversation - how NerdWallet is applying social to a FinTech product, Millennial consumers, Artificial Intelligence, Bitcoin, and why Tim tries to "be more analog", only checking into Twitter every 3 months. Listen to the interview with Tim on the Fast Forward podcast. Can your office furniture impact your productivity? Sophia Stuart recently visited the Herman Miller showroom in Culver City, CA, for a look at Live OS, the company’s new sensor equipped desks. Ryan Anderson, head of commercialization for Herman Miller's IoT Solutions, spoke with Stuart about the concept behind the furniture. Anderson commented, "We asked ourselves, what would it look like to have sensor-enabled furniture? In a mobile-first workplace, what are the new patterns of behavior?" To find out the answers, read Sophia’s article. Inside a nondescript, dodgy-looking building in the Mission is one of San Francisco’s most innovative dining experiences: Lazy Bear, a “modern American dinner party”. Once an exclusive supper club started by lawyer-turned-chef David Barzelay, Lazy Bear has become one of the hottest dining events in the city. You arrive, your coat is whisked into a closet, and a handsome host sweeps you into the cocktail lounge, where you're handed a welcome drink from the communal punchbowl. You dine on cocktail "snacks" like whipped scrambled eggs and soft-shell crab while getting to know fellow guests before dinner begins. Each seating at Lazy Bear is limited to 40 people, split between two communal dining tables in a gorgeous, dramatically lit room. Dishes are presented individually, passionately introduced by a chef as servers deliver them to the table. It's an evening designed for interaction - conversation is encouraged, and diners are invited into the kitchen, which is open to the dining room, to chat with the chefs as they cook. Creating scarcity: "Each month’s tickets go on sale all at once, usually at noon on a Wednesday in the middle of the previous month." And they are sold out every month. October reservations are on sale now. L.A. band Warpaint at Outside Lands. And finally, we spent the last few weeks of summer cooling off in the bay area and hit Outside Lands, the music festival held every August in Golden Gate Park. Royal Blood - what Mike Kerr can do with a bass guitar is nothing short of extraordinary. Sleigh Bells, a band we've been following since 2008. The difference in their performance between those early days and now is astonishing. Alexis Krauss is a force, reminding us to practice, practice, practice. To hear music from this year's festival, hit the playlist button below.